HotTrader can read in data from Premium Data in the "MetaStock" file format. HotTrader v2.08 supports the 2000-securities-per-folder MetaStock format. Navigate to the required data folder (e.g. 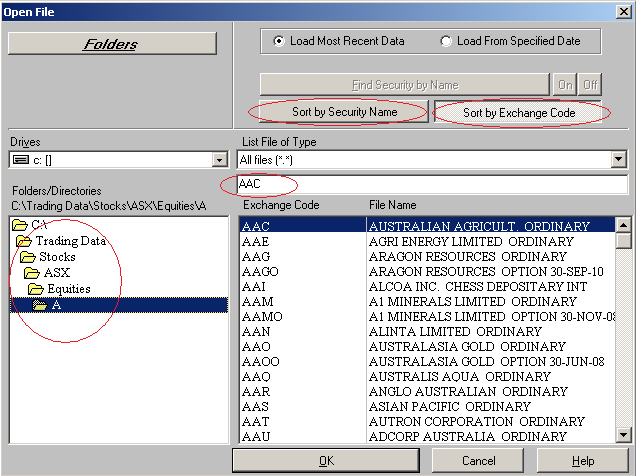 C:\Trading Data\Stocks\ASX\Equities\A) then select the security you want to view then click OK. You can sort by code or by the name by pressing the "Sort by Security Name" or "Sort by Exchange Code" buttons. Where can I get help on using HotTrader? HotTrader has a swing trading tutorial that is supplied with HotTrader. For further help see the HotTrader Web Site.